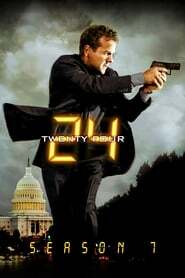 Season Seven, also known as Day 7, of the American serial television series 24, was to premiere on January 13, 2008, but was delayed for one year due to the 2007–2008 Writers Guild of America strike. On November 23, 2008, Fox aired 24: Redemption, a two-hour TV movie set between seasons. Season seven began in the U.S. with a four-hour premiere over two consecutive nights, following the format of the previous three seasons, with the first two hours airing on Sunday, January 11, 2009, and the third and fourth hours airing on Monday, January 12. Fox aired the remainder of the season without interruption on Mondays. Sky1 presented a two-hour premiere special on Monday, January 12. Another two hours were broadcast the following Monday, and a single episode on every subsequent Monday, meaning that the UK remained one week behind the U.S. Unlike all of the other seasons, this season’s DVD set was released one day after the season finale. The season’s storyline begins and ends at 8:00 a.m.